"Lord Nityananda, when passing on the street, saw a crowd of people howling at some incident, and on inquiry it was found that there were two rascals of the then name Jagai and Madhai. They were always disturbing people in drunken condition. Nityananda Prabhu thought it wise that these two brothers may be delivered so that Lord Chaitanya's mercy could be well known all over the world. When Lord Nityananda approached them He was immediately hurt by violent attack. On this incident Lord Chaitanya became very angry and He called for His Sudarsan cakra to kill these debauchees. 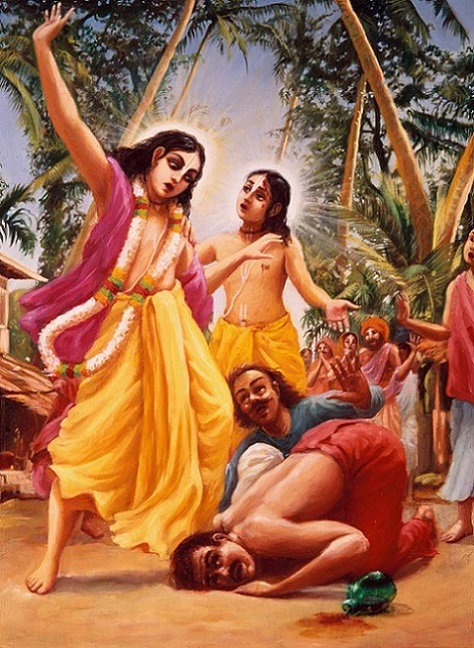 Lord Nityananda then implored Lord Chaitanya not to kill Jagai and Madhai but to save them. By this time Jagai and Madhai came to their senses and immediately they surrendered unto both the Lords and were delivered by the mercy of Lord Nityananda. So Lord Nityananda or Baladeva. is the original Spiritual Master, and such pure devotee sometimes takes the risk of life in order to reclaim a person who might have otherwise been rejected by the Lord. The devotee knows that the Lord wants all the fallen souls to come back to Home, and therefore the devotees always try to induce the conditioned souls to take to Krishna Consciousness by various ways and means. Therefore the conclusion is that a devotee is more kind than the Lord Himself." "Lord Nityananda when he was dealing with Jagai and Madhai maintained the maximum amount of tolerance and patience in spite of the greatest provocation. The two brothers, Jagai and Madhai, committee. violence on Lord Nityananda. Even Lord Chaitanya, the author of Siksastak, became agitated. But Lord Nityananda Prabhu in the matter remained calm and quiet and delivered the two rascals to the highest elevation. We should always try to represent Lord Nityananda Prabhu in the matter of preaching work." "Nobody can compare with the Merciful Nityananda. He can defend Himself quite well; He could have killed the sinners in an instant, but He had decided that He wanted to save these sinners. He was setting an example that we have to preach Krishna Consciousness even at the risk of personal violence. Just like the children sometimes become violent, but the father knows he can defend himself at any time, and so he tries to teach them correctly by reprimanding them." "According to Narottama das Thakura, one has to worship the Lotus Feet of Nityananda, and by His Grace one is able to worship Lord Caitanya Who transfers us back to Godhead." "Lord Nityananda is Balarama Himself, not an expansion of Him. Srila Narottama das Thakur has sung that the Lord who appeared as the Son of Nanda Maharaj has now appeared as the son of Sachidevi; and the same Balarama has appeared as Nityananda. This is the statement of Srila Narottama das Thakur." "Sri Narottama das Thakur says all sinful persons and suffering persons were delivered by the Sankirtan Movement inaugurated by Lord Chaitanya, Who was formerly the Son of Nanda Maharaj, accompanied by Nityananda Prabhu, Who was formerly Sri Balarama. If we keep ourselves purely on the standard of Lord Chaitanya's order, then chanting by us of the Holy Names of Krishna will descend as powerfully as He acted previously, during the time of Jagai and Madhai." "Nityananda Prabhu approached Jagai and Madhai at the risk of being personally injured and still He definitely delivered them. The world is full of Jagais and Madhais; namely drunkards, women-hunters, meat eaters and gamblers, and we will have to approach them at the risk of insult, injury and similar other rewards. To face such reverse conditions of life and to suffer thereby the results of actions is considered as the greatest penance and austerity in the matter of spiritual advancement of life." "In regard to praying to Lord Nityananda Prabhu I have written to you in my last letter that such prayer is quite appropriate. Our only prayer should be in the matter of desiring further development of devotional service and such sincere prayer should be submitted not directly to the lord but through the via-media of His bona fide servitor or representative." "Lord Nityananda is Guru. He can instruct us, but ultimately it depends on the disciple. A doctor may say 'Do this, Do not do this,' but if the patient does not follow the prescription, what is the result? Similarly, Nityananda Prabhu will hear the prayer of an insincere rascal, if that rascal actually wants to change his condition. One must agree not to be a rascal any more, then his rascaldom can be reformed. Jagai and Madhai begged the Lord for His mercy and they were prototype rascals, drunkards and debauchees. Lord Chaitanya told them first you stop your nonsense activities, then I will accept you. So a rascal may be accepted provided he agrees to stop his nonsenses. Otherwise, how can one expect to be reformed if he does not agree or like to be reformed. To be reformed, he must agree to the reforming process." "The two brothers Jagai and Madhai injured Lord Nityananda, but still he continued to preach, and they became great Vaisnavas. In the beginning we have to face awkward situations, but if we stick to our principles and continue to preach, things will come round to our favor." "Everyone is feeling some sort of anxiety due to the political condition, so I have given them a sort of hope that if they take to Krsna Consciousness their problems will be solved. It is not my mental concoction, but I believe in the words of Narottama Dasa Thakur that the shelter of the Lotus Feet of Lord Nityananda is as cooling effectively as the combined moonshine of millions of moons. So I am sure anyone taking shelter of Krsna Consciousness Movement will be happy. Please try to push this Movement on this process."